In the first week of July 1938, the football fixtures for the coming season were published. This was Brentford’s fourth season in the First Division. I scanned the list looking for the Arsenal game. It was on Thursday, September 8th, with the kick off at half past five. I was 17 and working until seven in the evenings and was disappointed the game wasn’t on a Saturday. I thought about taking the afternoon off but couldn’t afford to. Normally the factory shut down for the first week in August but our Governor wanted volunteers to work that week …. salvation! I volunteered and took time off for the Arsenal game. I used to play for a Sunday League team in Brentford. Two days before the Arsenal match I was with the lads at the Blondin recreation ground. We’d been there a little while when a storm came over. The rain came lashing down and thinking it would be over in few minutes, we all rushed for shelter under a tree. But the tree was struck by lightning. One of the lads was killed straight away and I was knocked out and remained unconscious for fourteen days. When they first got me to hospital, the doctors gave me half an hour to live, but I gradually improved. I was in hospital for six weeks and it was nine months before I could go back to work. I had to learn how to walk again. All my hair had been burnt off. Even now, I’ve still got burn marks on my skin from the metal stud of my collar and the buckles of my braces. I was wearing cufflinks because I’d been to the pictures before I went to the park and I’ve got burn marks from them too. I’ve even got burn marks on the soles of my feet from the nails in my boots. A few weeks after I’d gone back to work, the Second World War broke out. I received my call-up papers, but failed the medical due to my injuries. I wasn’t fit enough to be killed. That’s the way I’ve always looked at it. A blessing in disguise. It was fate. I’m 85 years old now [when the story was written] so I haven’t done too badly. 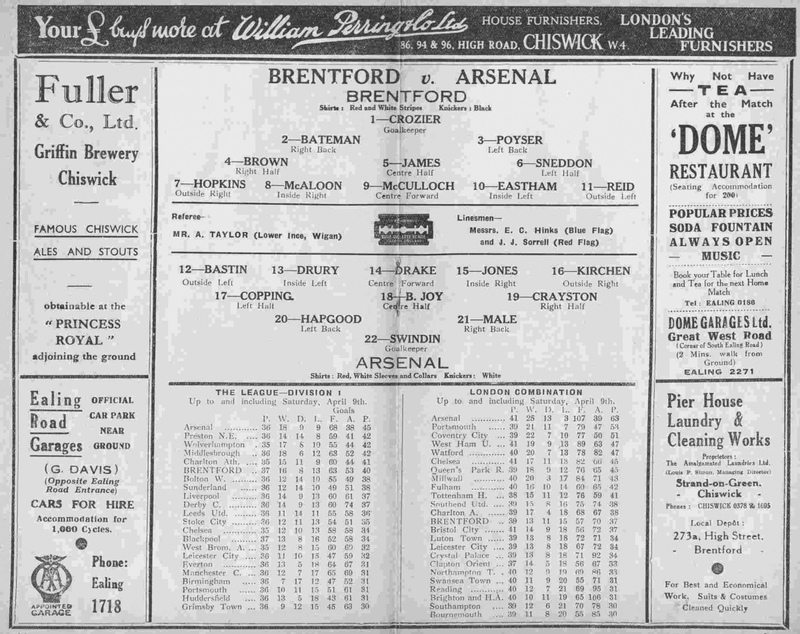 If Brentford hadn’t been playing Arsenal and if I hadn’t had that week off work, I wouldn’t have been at the park that evening. I didn’t find out the score of the match until about two months later. We won one– nil through a Gerry Mac Aloon goal.